You’ve just finished watching Rocky 4 and are raving about Sylvester Stallones’s biceps with your group of friends and suddenly a fleeting thought crosses your mind. Why can’t I have biceps like him? Well, the answer to your question is a resounding ‘Yes’ and in quick time too. The need of the hour is to start out with a vengeance and this piece will give you 3 keys to unlocking those biceps of yours, enabling you to fulfill your dream. Yeah, you heard it right, it is the ‘Grand Daddy’ of bicep exercises, simple reason being its best for trainees, new to the world of exercises and an enabler for maximum strength development. Standing with your feet slightly apart (in line with the shoulder) and toes pointing slightly outward. 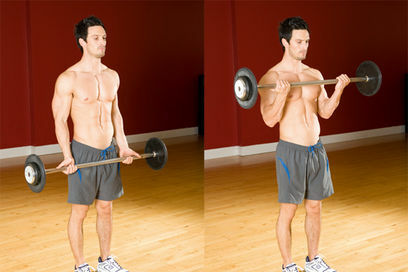 Hold the barbell at shoulder width, with palms facing up and extended arms in front of your thighs. Now with an erect posture, try to lift the barbell and complete a semi-circular motion at moderate speed. Hold the barbell at the top for a couple of seconds and continue the downward motion. Carry out the exercise with 2 sets of 15 reps for best results. A word of caution must be added though, performing this exercise with less weight initially and avoiding leaning back while lifting, can only do wonders to those biceps of yours, apart from saving you from dreadful injuries. 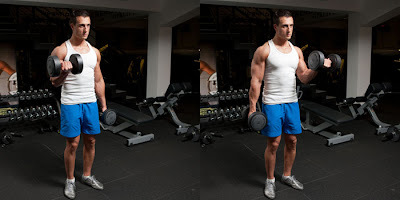 Grab dumbbells in both hands (according to one’s capacity) and stand with both feet apart, preferably at shoulder width. 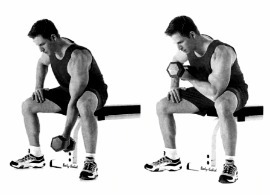 Now, with palms facing up, lift the dumbbell in each hand in alternating motion. Best results can be achieved if you let the biceps feel the pressure by holding your motion for a bit and then lowering the dumbbells slowly. The burning sensation, after 2 sets of 12-15 reps can leave you feeling high and strong. Most importantly, it can give your biceps the much needed ripping effect. Sit with your legs spread slightly apart, hold the dumbbell in the hand which you want to work out. Bend slightly and allow your elbow to take cushion on the inside of the thigh close to the knee. Rest the other hand on the other knee and with palms facing upwards carry out the curl motion. Wait for a few tantalizing seconds after lifting the dumbbell, to feel the full effect of the workout. With no helper muscles involved, this drill makes sure your biceps get the attention they desire. Having these 3 exercises in your kitty, will surely go a long way in ensuring your biceps become the talk of the town inside a month and your friends gunning for your expert advice. Oh! And while you are at it, don’t forget to add boiled eggs to your diet for some special effects. Krupesh Padave (KP) has a flair for writing and his favorite hobbies include reading and listening to music. An adventure junkie, he wants to go globe trotting after gaining sufficiently deep pockets.